Today was not a good day. I had a bad attitude and I lost control of myself. I woke up late and rushed to get everyone dressed, fed and raced out the door to their swimming classes. I chose to snooze the alarm, check Facebook (uh-huh) after I finally woke up and dilly-dilly-dallied before I looked at the clock and panicked. I had to pump, get the boys fed, changed, and into the car all in 15 minutes! Uhhh no way that was possible! I quickly got up, pumped Titus’ milk, changed him and went to get Micah in his room. 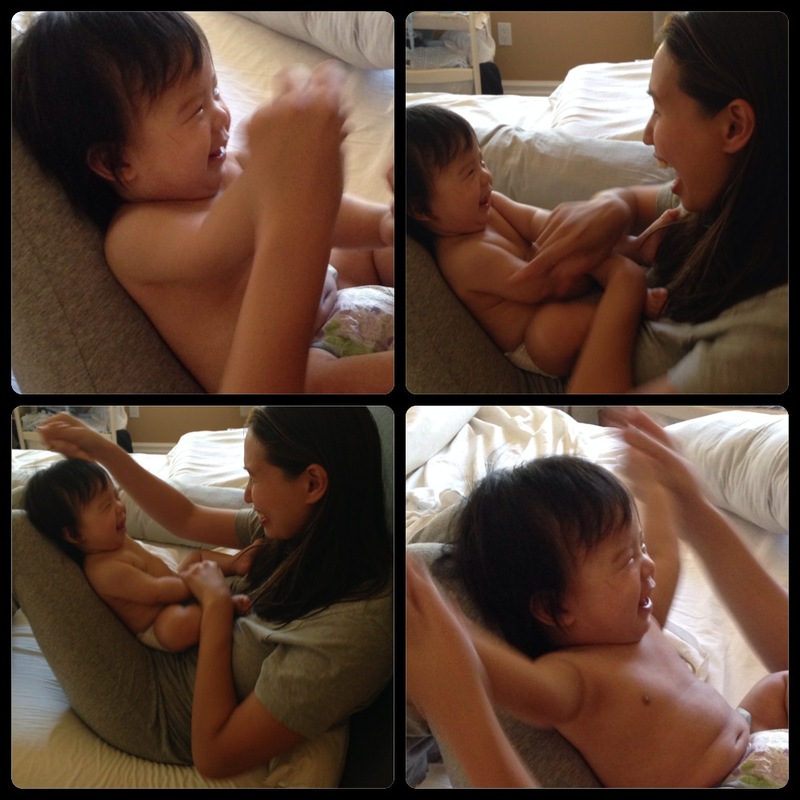 Micah was happy and energetic like he always is in the morning, but mommy’s agitated spirit caused his mood to change. I greeted him with a cheerful good morning but followed it up with a “Get up! Let’s go! We gotta go now! Hurry!” I could sense that he felt stressed because he wanted a morning hug but instead he was greeted with mommy’s bad attitude. I told him to hurry up or else he wouldn’t have any breakfast. I had packed his cereal to eat in the car but my empty threat had given him an anxious heart. I carried Titus and the swimming bag to car and yelled, (yes, yelled.) “Micah, I said let’s go! NOW!” in a mean and rude voice. Micah started crying. He started whining as he made his way down the stairs and out to the garage. His cheerful disposition had disappeared. It was replaced with apprehension and distress. He quickly got into the car with tears rolling down his eyes as he whined about wanting his cereal. In my stern and angry voice I told him to sit down and buckle up. The whole time I knew I was struggling and battling my flesh. I tried hard to control my temper but I lost it. It was silent for a few minutes as we drove away. 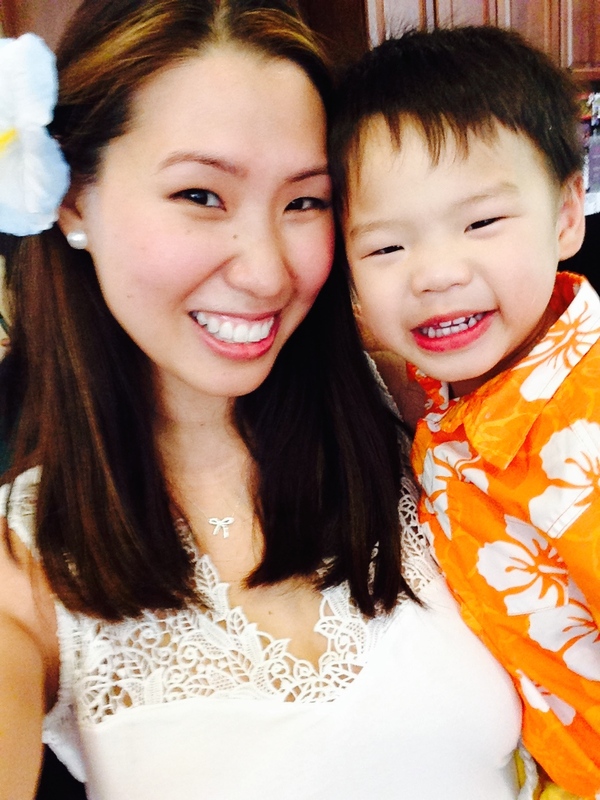 After a while, Micah quietly and humbly said, “Mama, I’m sorry for crying and whining. I’m sorry God. I had bad attitude.” I was taken aback and convicted. My heart sank. I realized that it wasn’t his fault at all that we were late. It was mine. I woke up late. I was slow. I chose to check Facebook over getting ready sooner. He was actually up earlier than I was and was just waiting for me to come inside his room. (because that’s the rule.) I pulled over, looked up at the rear-view mirror and in a gentle (much gentler) voice, I responded, “Micah, I am sorry. Mama is so sorry for yelling. I was wrong. I shouldn’t have yelled at you at home. I could have asked you nicely to get ready but I shouted at you instead. That was not kind or pleasing to God at all. Will you please forgive me?” He smiled as he looked back at me and said, “It’s okay Mama. I forgive you. Let’s pray and say sorry God.” We prayed together as I asked the Lord to forgive my rude and harsh behavior. I asked Him to teach me how to speak gently and control my temper. Micah quickly added that he was sorry for crying and whining. My heart was blessed, convicted and touched by the Holy Spirit. My son not only showed humility, he showed me grace and forgiveness. He showed me how to quickly forgive and with a smile. He showed me how to apologize sincerely and how to receive apology graciously. He taught his mama how to turn to God in prayer after I offended our Heavenly Father. God truly touched my heart in a remarkable way today. 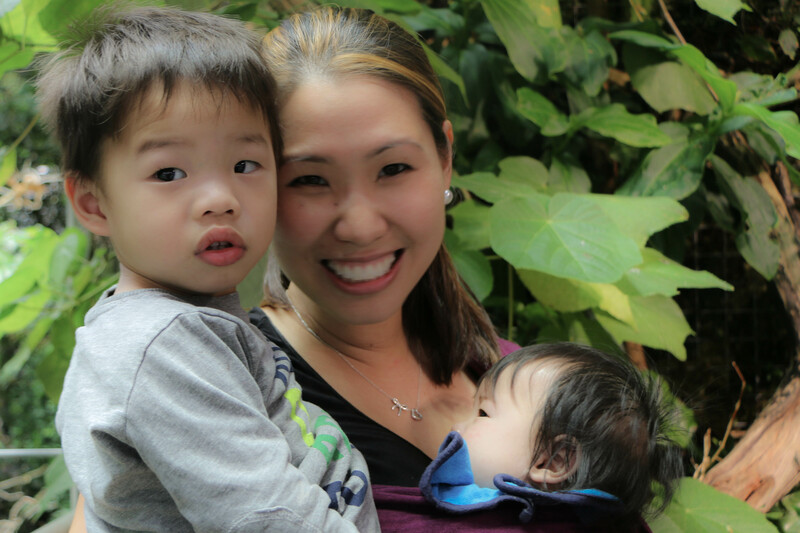 As I shared my guilt and shame with my husband, I realized that I am such a recipient of grace and I too need to extend that to my son and others. I admitted that it was my fault because I was late but instead of owning up to it, I blamed Micah for it and rushed him so we can make up for loss time. My sweet husband encouraged me that this was a great reminder for me but also a great example to our son. He graciously said that I showed a great example by apologizing and acknowledging my mistake. I gotta admit, I’m usually the teacher but today, I learned a lesson or two from my toddler and it was good. He showed me how a humble heart, a gracious smile and a sincere apology can turn an unpleasant morning upside down. God allowed me to experience Him through my two and a half year old. In the midst of my chaos, I can have peace. 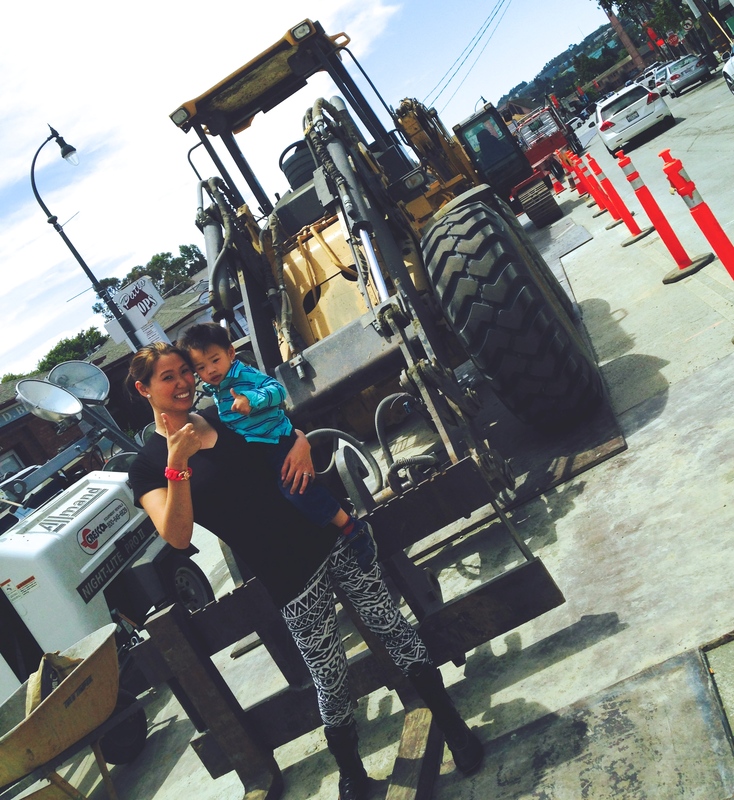 My interest sure has shifted from tiaras and tutus to trucks and trains after having a little boy. I’ve driven by construction sites countless of times but it has never caught my eye. I never even stopped for a glance. Heck! It wasn’t even on my radar! But having boys has definitely diverted my attention. Now, I would spot it from a distance! 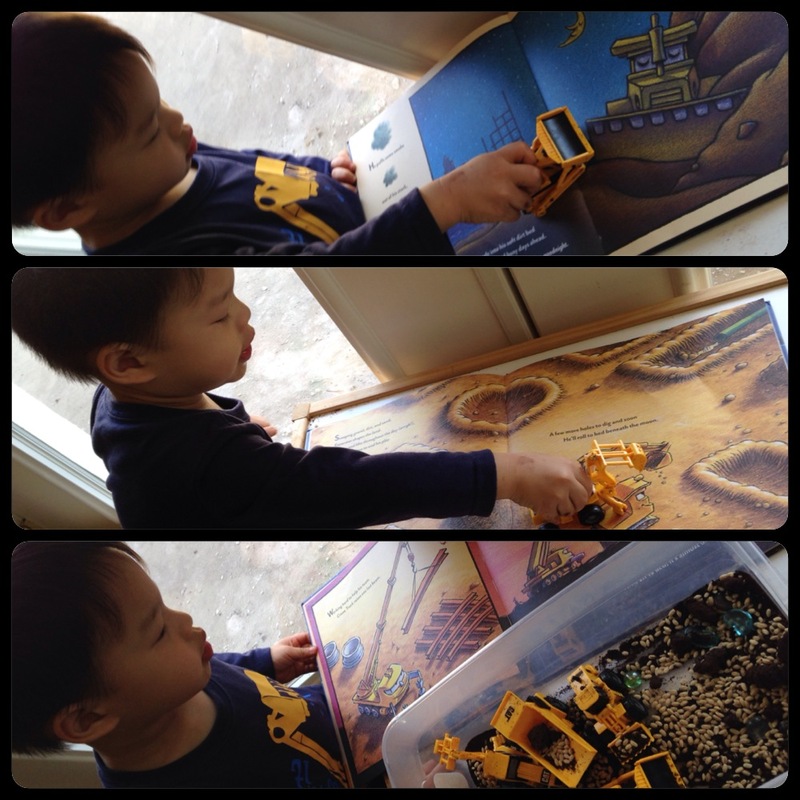 After I saw how much he loved his construction book “Goodnight Goodnight Construction Site” (great book by the way!) 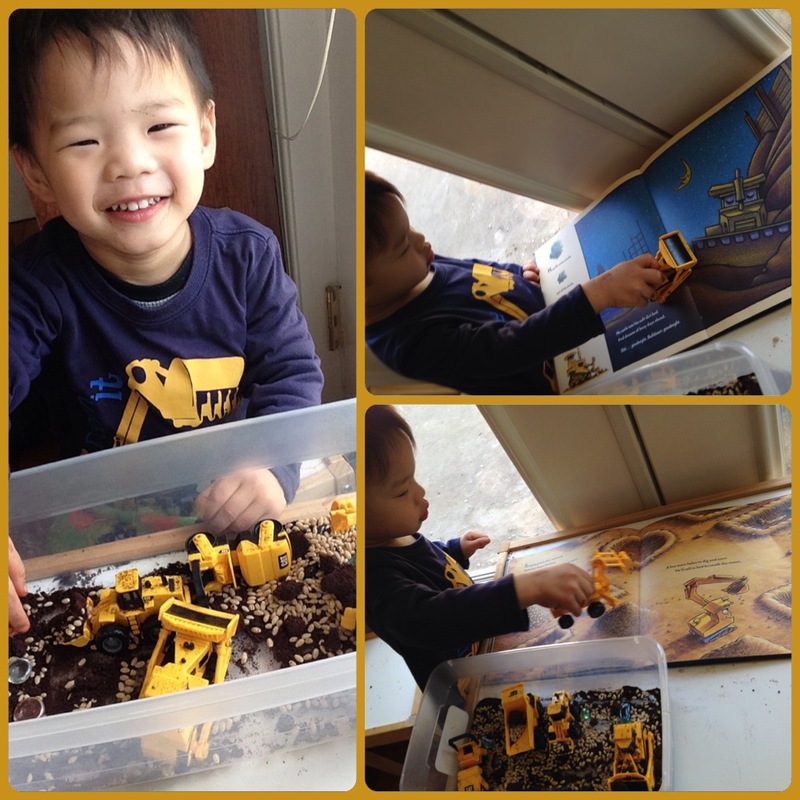 I thought it would be fun to make it come alive by allowing him to have his own little construction site. A couple of weeks ago, we were also fortunate enough to get up close to a real bulldozer when we saw the tow truck drop it off onto the site. I asked permission from the driver if we could get close and take a picture with it. Micah was “truck-struck.” He couldn’t believe how gigantic the machine was. It never looked that big in the pictures! I gotta admit, that was pretty cool even for my husband and I! 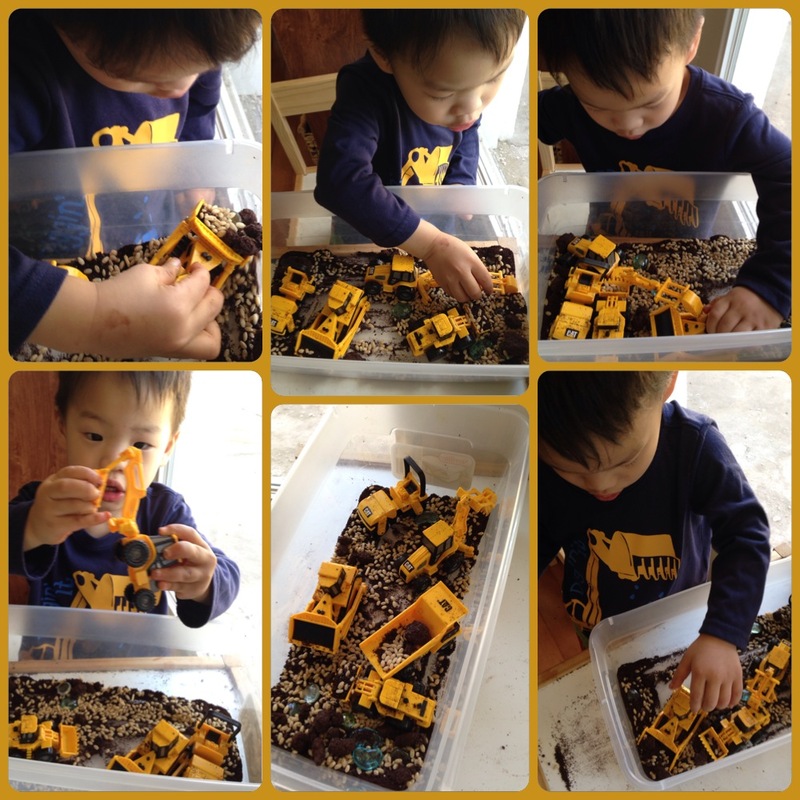 We built our own construction site sensory bin. 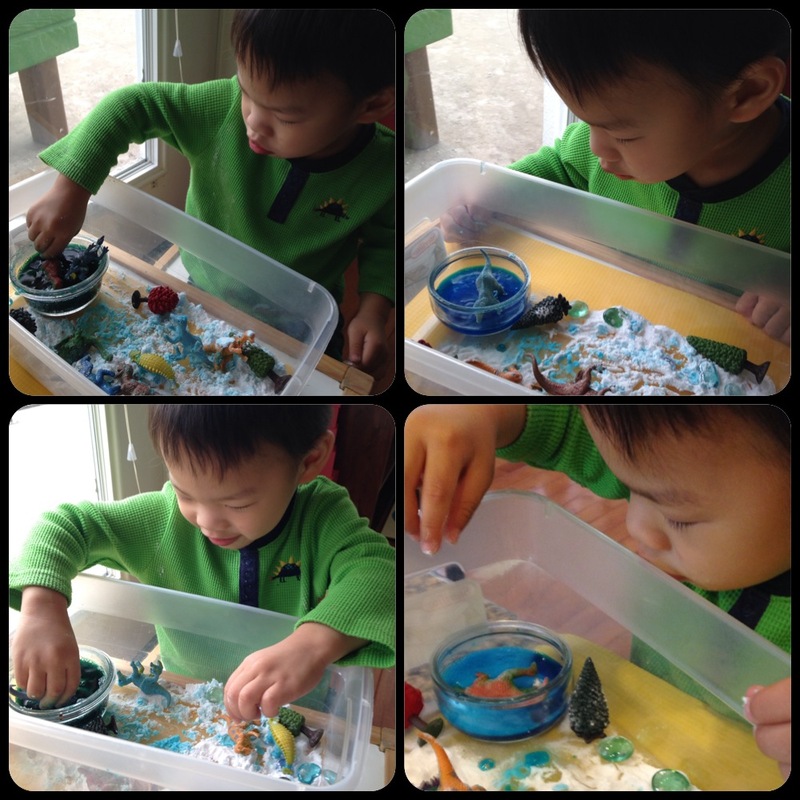 A sensory bin is a small container with a variety of materials placed together to stimulate the senses. 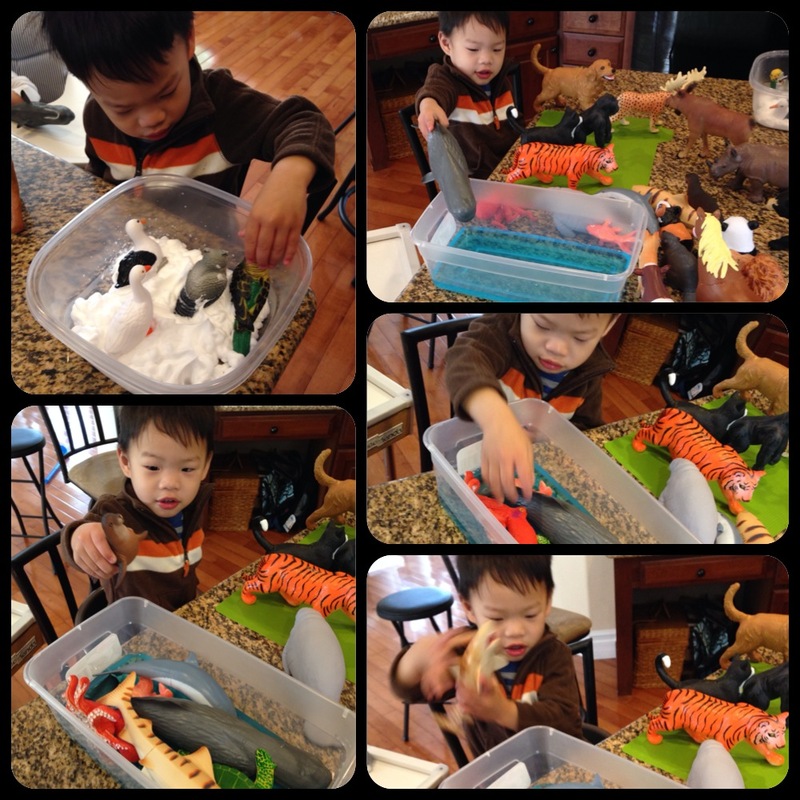 Sensory bins give your child opportunities to assume the role of a scientist and explorer as he handles, manipulates, sorts, and examine the items in the bin. They also increase your child’s ability to be attentive. The potpourri of items in your bin will give him the ability to make decisions on how he may want to use them. Creativity and imagination are given a free reign. Self-discoveries allow for new concepts to form such as new vocabulary, sorting, and integrating old and new knowledge. 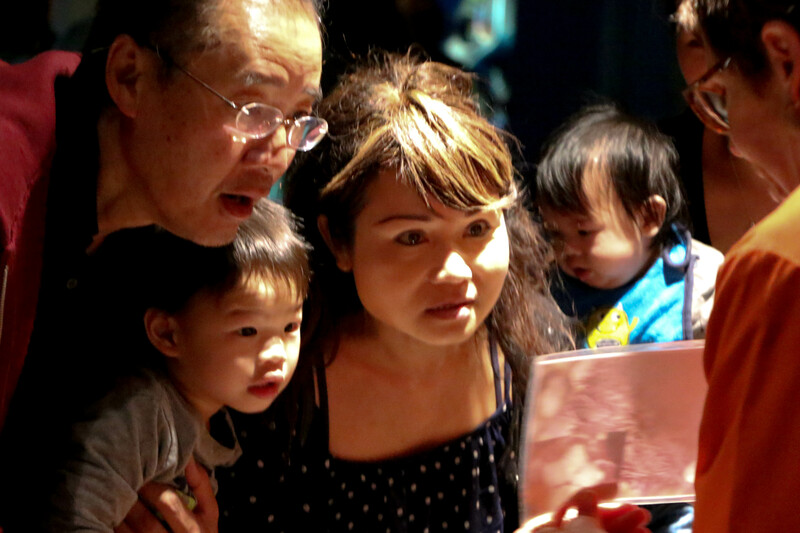 You are also giving your child the opportunity to develop the essential sensitive period of refining his senses. 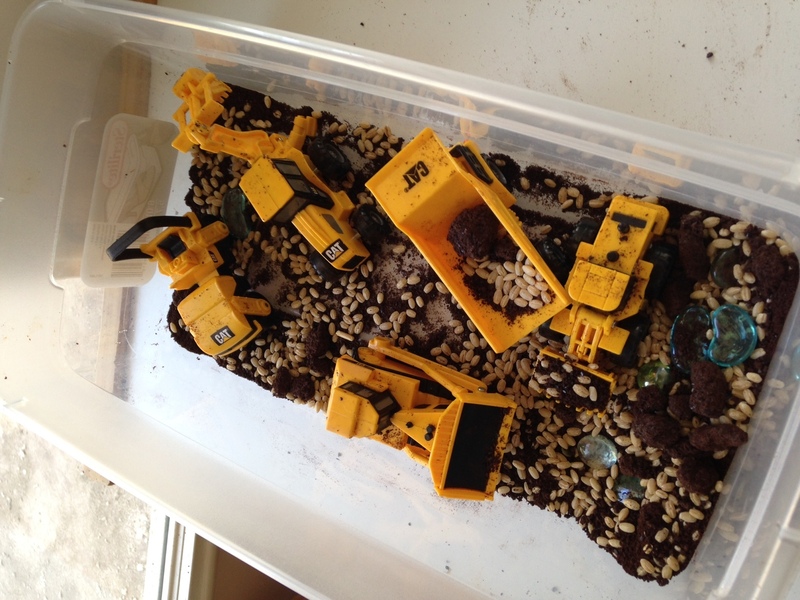 For those of you who have a couple of children, it gives them a chance to work together. As an added bonus, did I mention that it is so much fun? 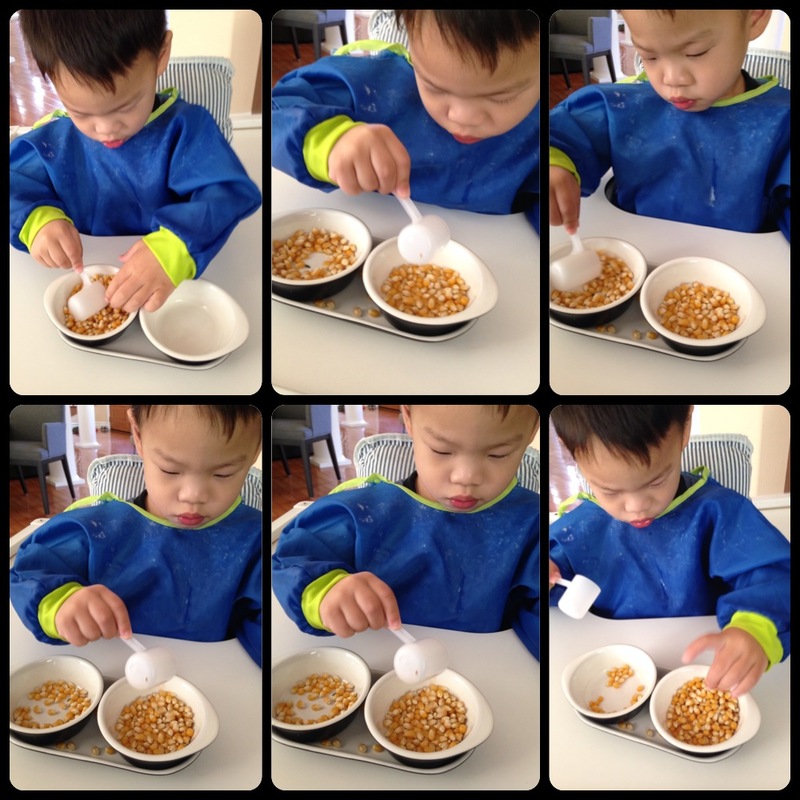 Micah enjoyed these sensory bins so much so that not only did it occupy him for 1.5-2 hours in the morning, he asked to do it again after he woke up from his nap. It fostered lot of independent work, exploration and self-entertainment. 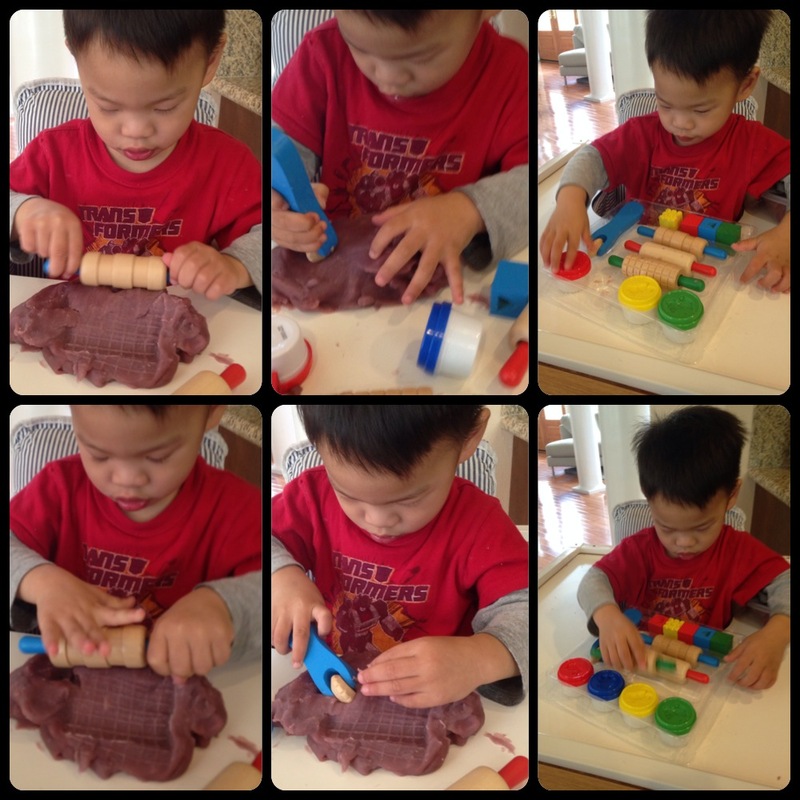 I observed how he worked with his materials and used his imagination. Phrases, sounds, and memorized paragraphs of books that contained those items were being recited. He even got the books that he associated those items with and integrated them to his activity. He also cleaned them all in the sink after he was done because the coffee beans made them a little sticky. He even asked to wear his crane truck pjs to match his work for the day! He was reciting the lines he memorized from each page as he matched each truck. After seeing how much he enjoyed the trucks, I decided to do it with dinosaurs too. I was able to find a book that included the dinosaurs and had information about them (which made it so much easier for me since I don’t know what they are called). He had a blast and I did, too! It brought me joy to see that such simple things can bring such delight to him. Best of all, we used everything we had at home and incorporated them into the activity. Can you see what I picked up? 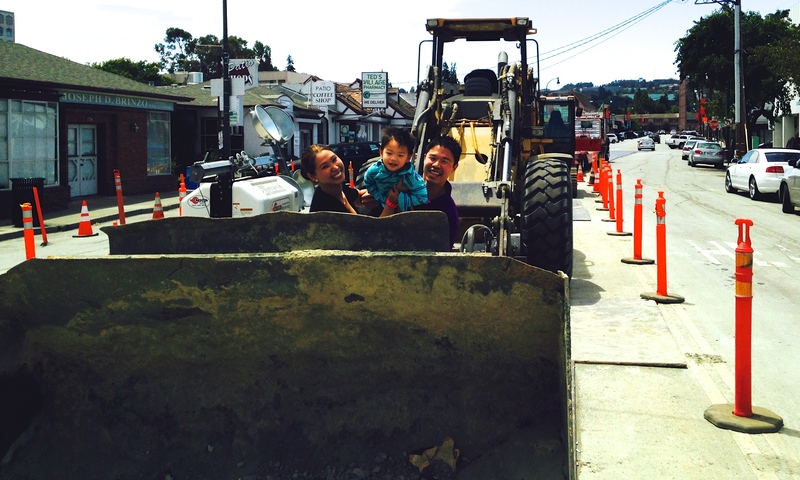 The bulldozer, excavator and the dump truck all had their share of fun…now it’s your turn! Jurassic Park: plastic bin, Junior Groovies dinosaur book with dinosaurs inside, small container with vinegar (as lake/”bath tub”) with a drop of vanilla extract, blue food coloring (to make it look like a lake), baking soda, marbles, trees collection from Safari Ltd. Check out both their smiles! These two are such eager learners! Micah loved being in his Jurassic Park dream world. My original thoughts were, the baking soda would be the ground, the vinegar would be the lake and the marbles as the rocks. But he had a completely different idea in mind. He pretended that it was a dinosaur bath party! The baking soda was the soap that he covered the dinosaurs in and he gave them a bath in the vinegar tub. The fizzle effect caused by the reaction of the vinegar and the baking soda really entertained him. I would hear him say words like dinosaurs take turns, wait in line, and “Yehey! 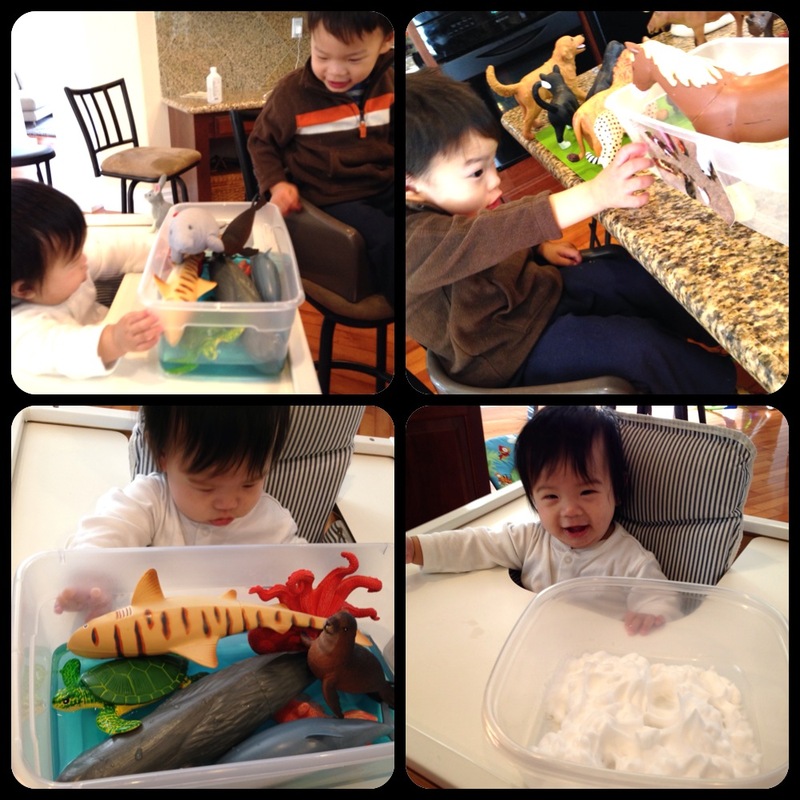 Bath time!” It was fun to see and hear him use his imagination and get creative. I changed the vinegar every 20 minutes when it stopped fizzling. Towards the end, Micah asked for two containers with different colors, he used it to sort out the marbles from the dinosaurs. Concentration and fascination at its finest! Vinegar + Baking soda bubble bath was a real dinosaur treat! 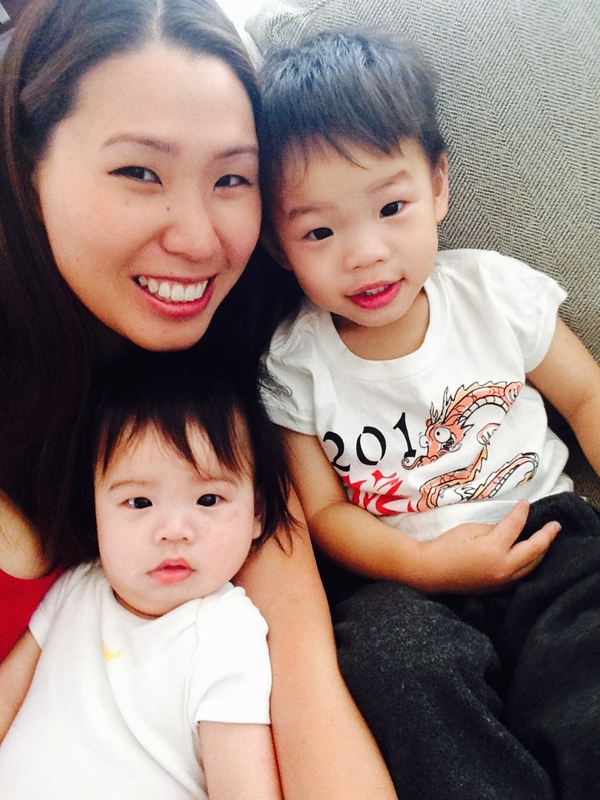 I hope you’ll get inspired and create your own little spaces for your little ones to enjoy. Feel free do share your ideas here, too! Teaching my boys about the Lord is a top priority in our family. Raising them to love God’s Word and obey it is our desire and prayer for them. This week, as we went through our Bible study, I decided to teach them about creation. 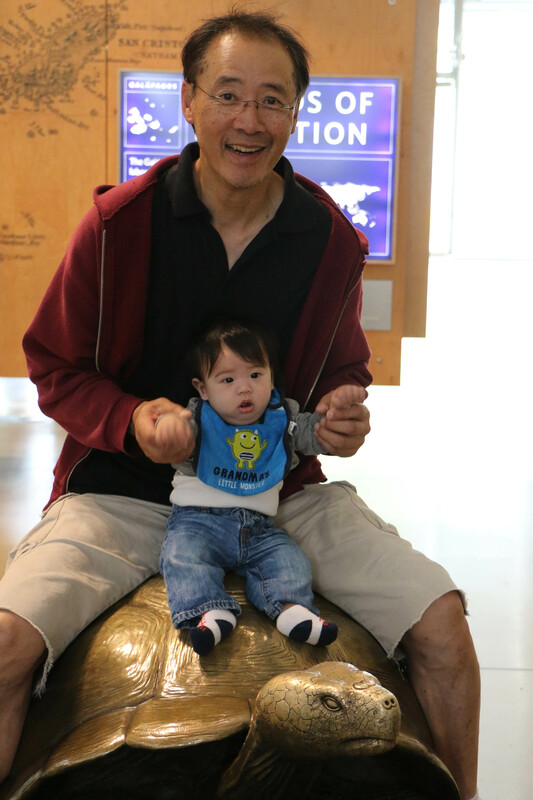 I wanted them to know and understand how great our God is since I knew that at the end of the week, we would be visiting the Cal Academy of Sciences. We went through each day following what God had created. I came up with these activities to go with our lesson to make it more fun and exciting for Micah and Titus. ACTIVITY: I would shine the flashlight on different parts of a dark room. As the flashlight is on I would say, “light” and if it was off I would say “dark”. He also learned day and night. He had a lot of turning the flashlight on and off and shining it on different parts of the room. ACTIVITY: I had a lot of fun with this one too! I got a clear glass and filled it half way with water. 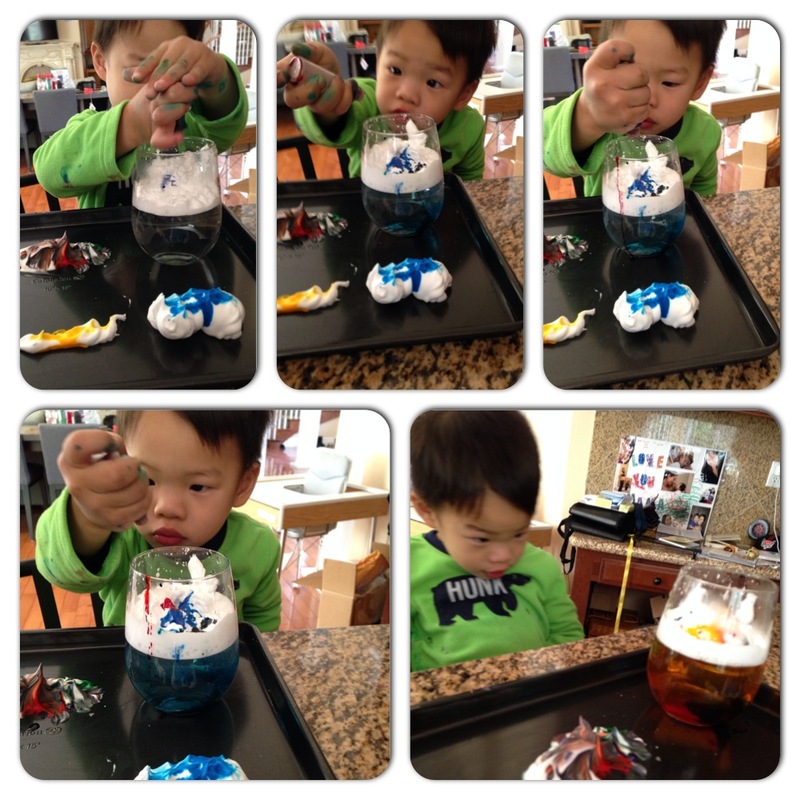 Then I filled the top half with shaving cream to represent the sky. I asked Micah to drop blue food coloring to emphasize the difference. Then later, we learned about the different kinds of clouds as we continued to experiment on it. Genesis 1: 11-12 Then God said, “Let the land sprout with vegetation—every sort of seed-bearing plant, and trees that grow seed-bearing fruit. These seeds will then produce the kinds of plants and trees from which they came.” And that is what happened. 12 The land produced vegetation—all sorts of seed-bearing plants, and trees with seed-bearing fruit. Their seeds produced plants and trees of the same kind. And God saw that it was good. Genesis 1:16-18 God made two great lights—the larger one to govern the day, and the smaller one to govern the night. He also made the stars. 17 God set these lights in the sky to light the earth, 18 to govern the day and night, and to separate the light from the darkness. And God saw that it was good. ACTIVITY: I prepared the 4 cookies and I ended up using just the full moon and new moon because the quarters were a little hard for him to understand. I took it away and focused on the two he concepts he was able to grasp. Of course, you guessed it. He ate the cookies after! But only the bottom part of the full moon without the cream (I didn’t want him to get hyper! Haha!). When we were done, we went outside and sang the song Mr. Sun as he pointed the sun to me and we even got his sunglasses because he said it was too hot. ACTIVITY: I had him lay them all out and name the animals one by one as I shared the verses with him. 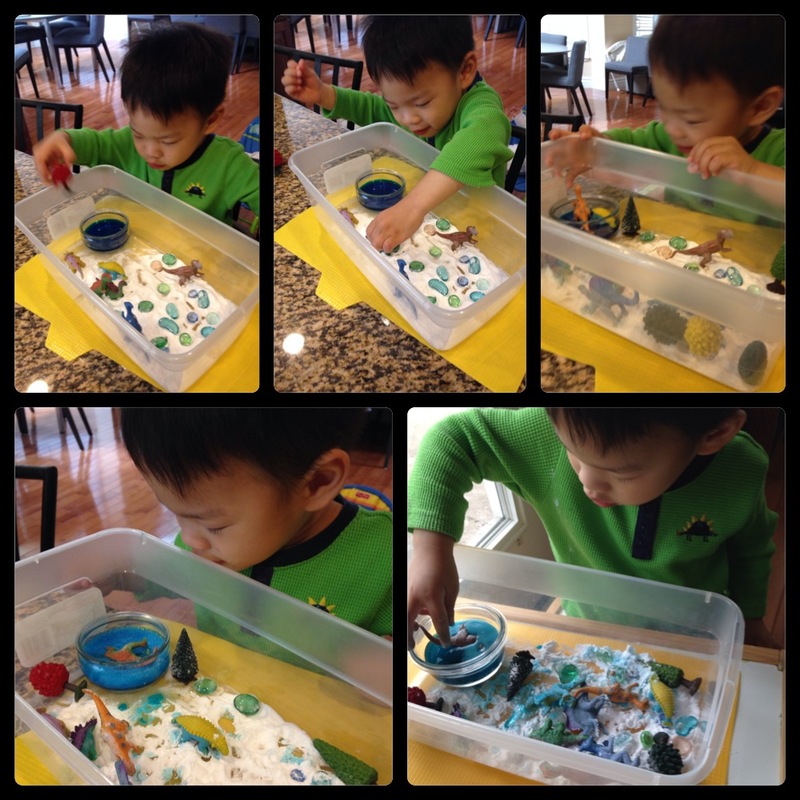 He had to put the birds in the “sky” (shaving cream container), land animals on the green mat and sea creatures in the tub of water. Then of course at the end, we had to wipe down the sea creatures before putting them back in their proper containers. We sorted the animals according to their habitat, (farm animals in one container, jungle animals in another, etc) and as a reminder to which container they go, I placed a picture on the outside. Genesis 1: 27 So God created human beings in his own image. In the image of God he created them; male and female he created them. 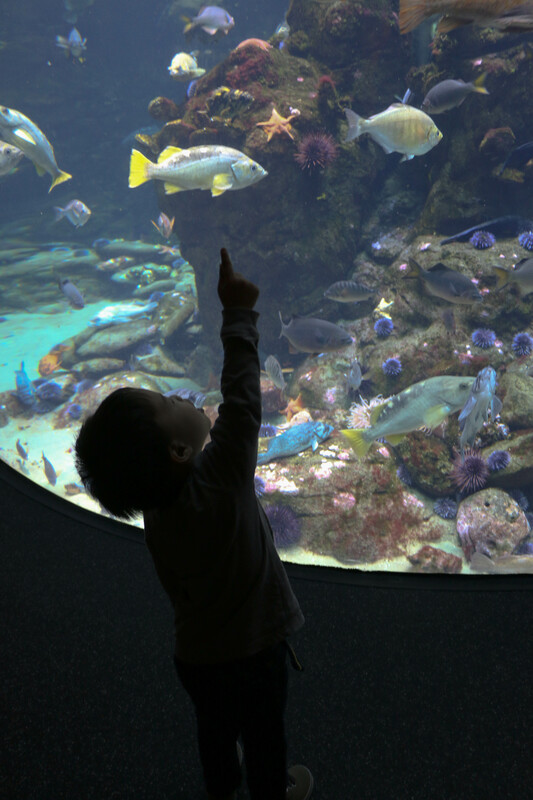 CAL ACADEMY OF SCIENCE was a great way to end our lesson! Everyone had a blast learning about the beautiful creation of the Lord! 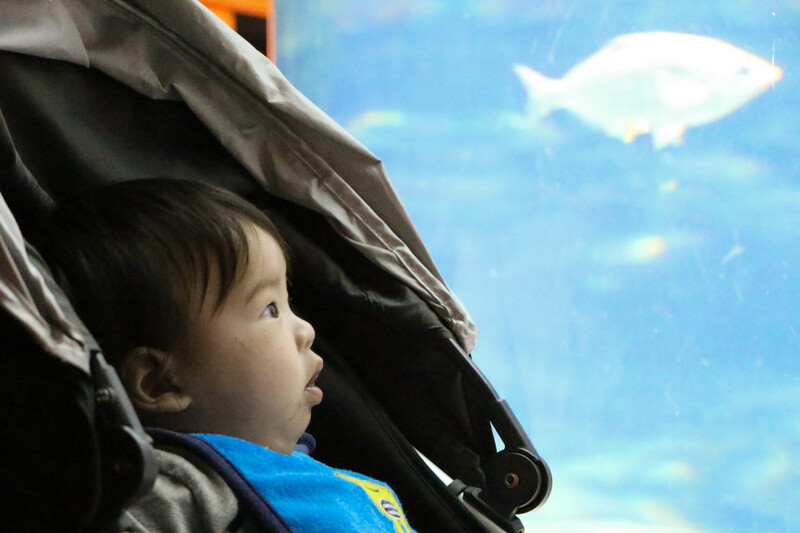 Titus was mesmerized by the fish. Stick your hand in the touch pool! Titus touched the sea urchin! Mama! God made the fish! Everyone learned something new that day! Congratulations! By the ripe old age of three months, your baby is no longer a newborn. Your little one can now turn his head when he hears your voice, waves his hands, and kicks his feet when he feels excited. He has mastered the much-awaited grins, gurgles, and giggles. Not to mention the infamous cry to express joy or pain. 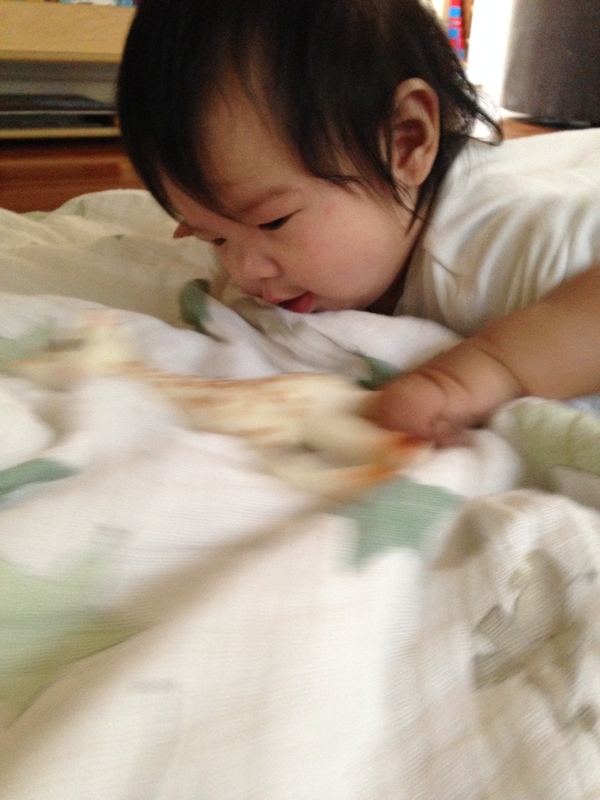 Good bye passive newborn, hello active infant! Your buddy is now stronger, more active, and can use his body to reach, pull, and manipulate the world around him. How amazing it is to see all the creative ways they explore! These activities aren’t just a source of entertainment for our little one they are all learning experiences through which life skills are developed along with his sense of self. This is the time to usher in the new era of exploration! Sing songs with hand movements. 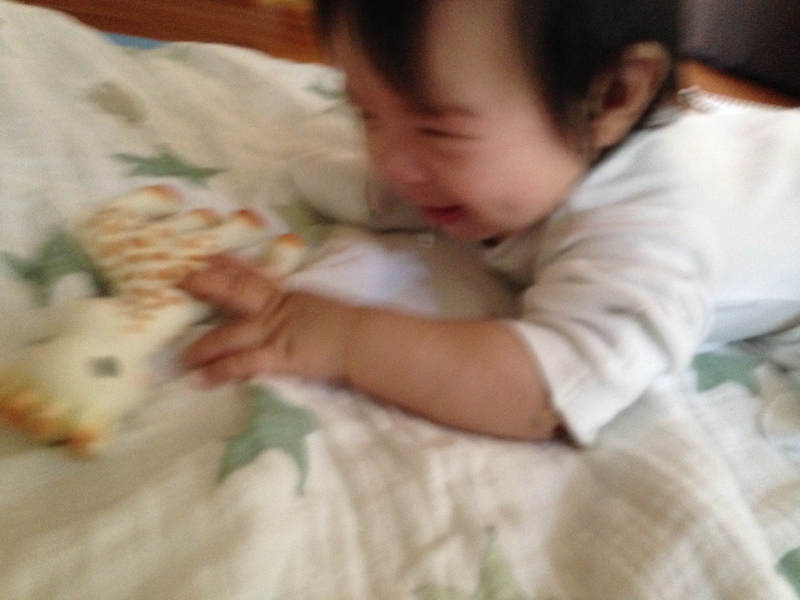 Give him toys that shake, rattle, and roll. Get him to scream in laughter with high flying rides and tickle games that require the use of his whole body. 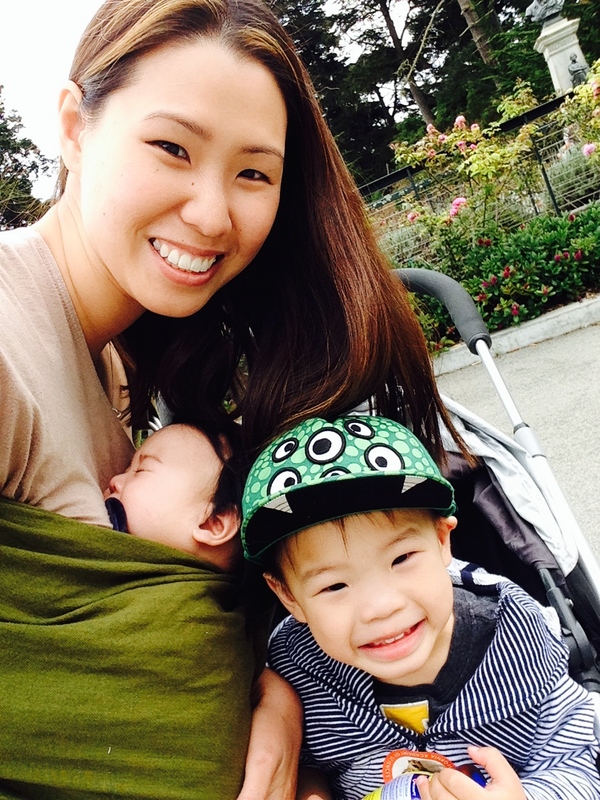 The reward of exploring with your baby and his body is the wonder of interaction. Seeing him enjoy it will bring a huge smile to your face, too. 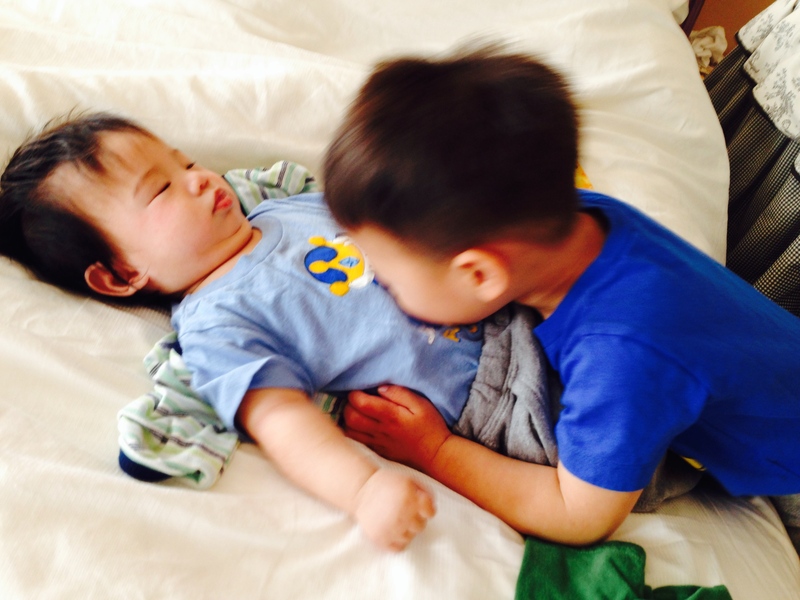 Bonds of love and trust are formed through early interaction and play. Spontaneity can make these interactions even more fun and rewarding, so find an opportunity at every turn! You can play peek-a-boo games during diaper change, tuck your baby in a sling while you vacuum the floor, throw in a little dance or two while you do the dishes while he watches you, and burst into song or whistle while you work can help turn a fussy infant into a giggly one. 1. This Coo is For You! 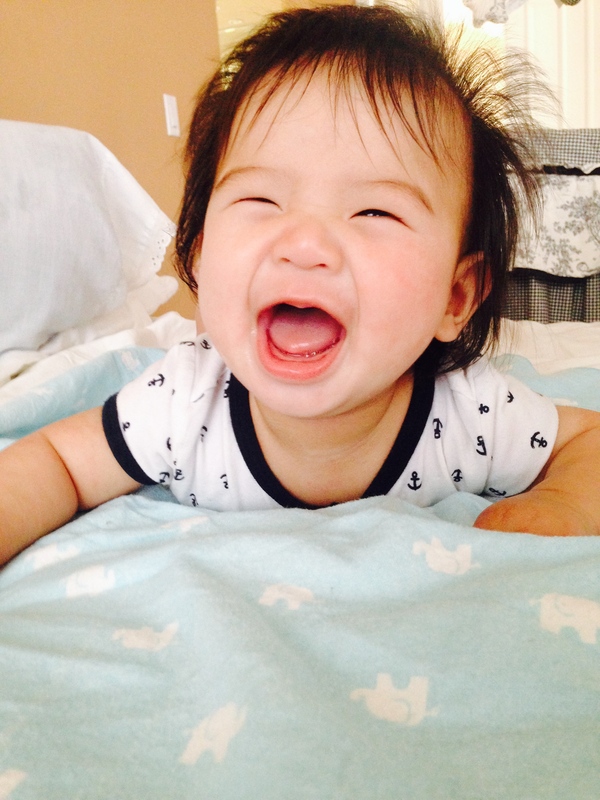 From 3-6 months, your baby is often a social being full of the cutest coos and irresistible smiles. 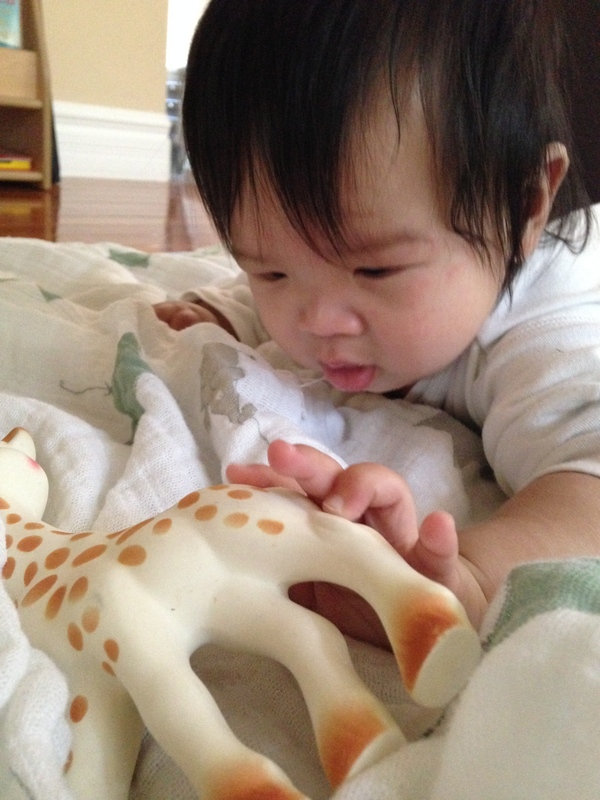 Although he can’t say real words yet, the adorable sounds he utters are his way of exploring the world of communication. He learns from the responses you give to these vocalizations. To help boost language by understanding what he hears and saying his own words, keep talking (and talking and talking) to your little one. Speak slowly, clearly, and simply. By responding to your baby, you are showing him that you value what he has to say and will encourage him to communicate even more. A squeal or squirm is a great way to see that he realizes you are following his body movements and are interested in what he has to say. Grandpa and Titus enjoying a fun conversation! 2. Mirror Mirror in Front of Me, Who is that Cutie that I see? 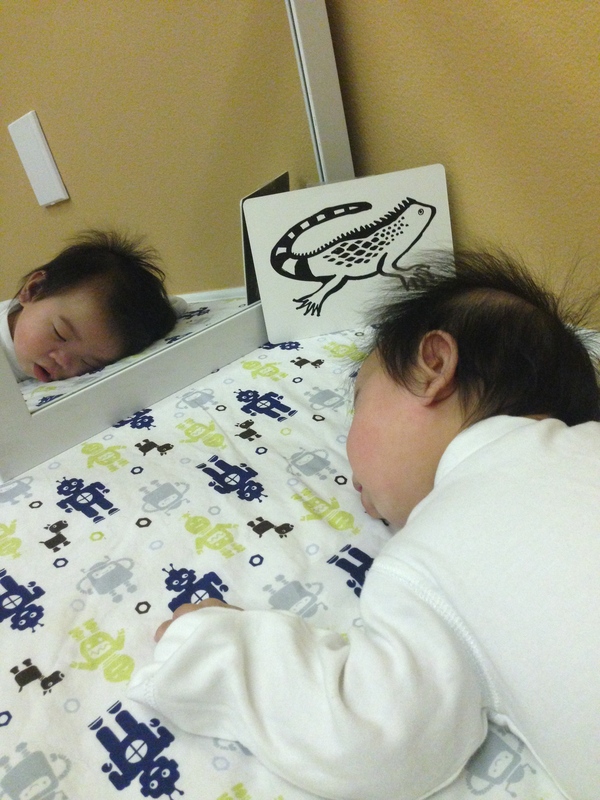 Watching his own face and interacting with his own image in the mirror increases your baby’s budding awareness of himself as a separate person. This is very amusing to him. You gotta admit, I bet you can name some adults who can look at themselves for a pretty long time! Here’s what you can do. 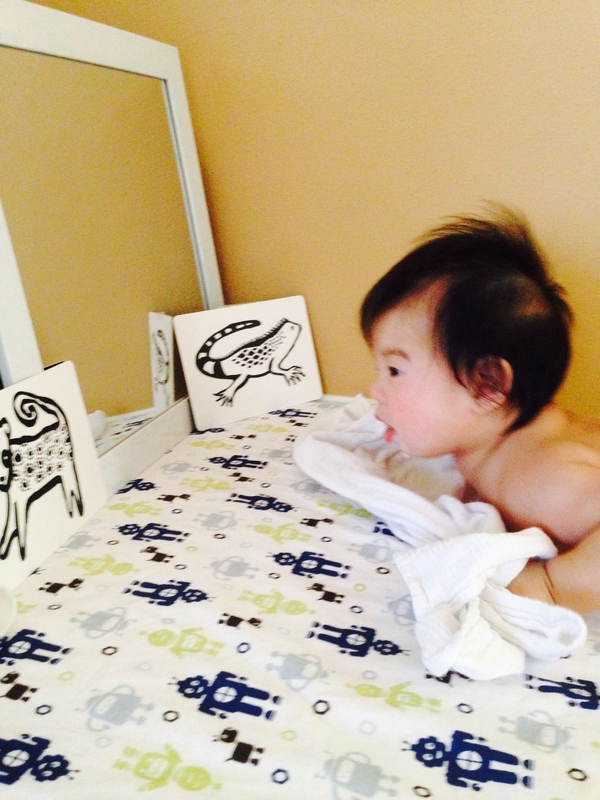 b) Point to the baby in the mirror and introduce him to himself. You can name the parts of his face as you point and touch each part. 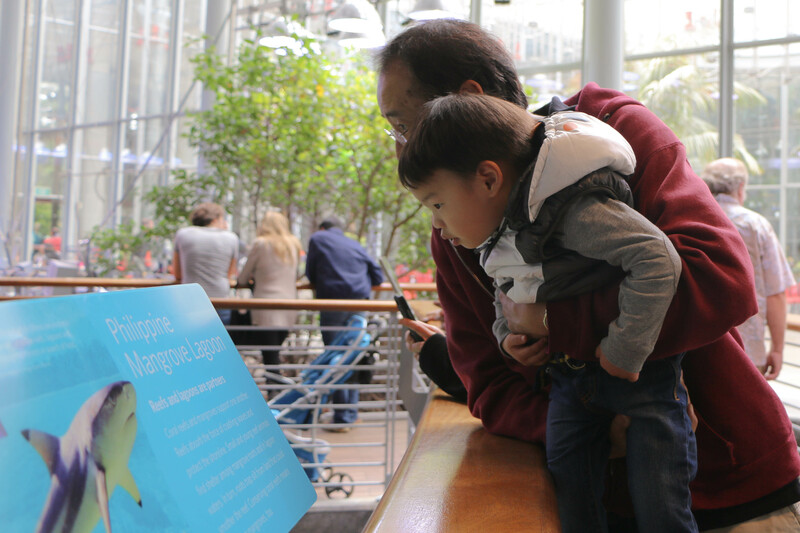 The mirror helps your learn to track, focus and explore. It promotes upper body strength and visual stimulation. Follow his lead, he can quit if he has had enough but don’t be afraid to challenge him by going a little longer each time. Our little Titus used to dislike tummy time. We would put him in his tummy and he would fuss and fret for a while, when he realizes help isn’t on the way, he plops his head and goes to sleep! It happened every time! 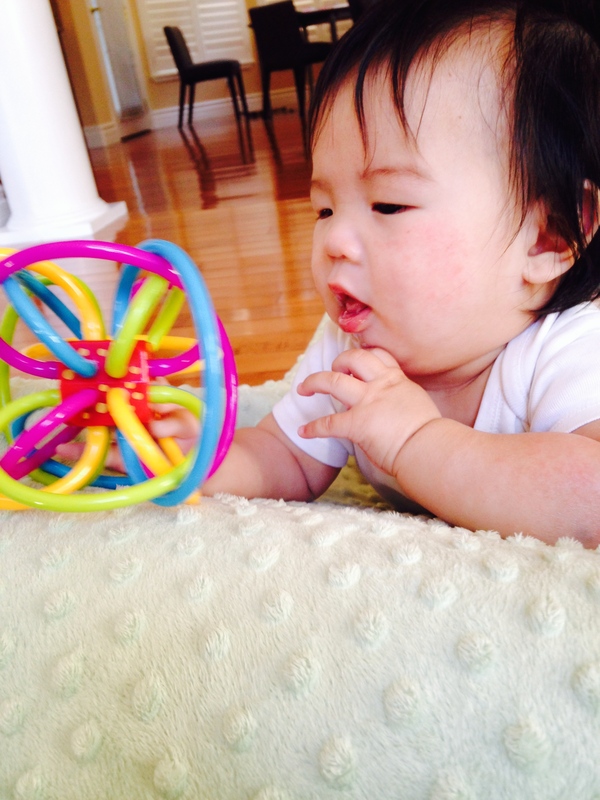 This encourages your baby to make early efforts to grab things and move his body towards something or someone he wants like a ball, a colorful toy or you! Creeping forward, rolling over, or just s-t-r-e-t-c-h-i-n-g as far as he can go will help him develop those little muscles. Be careful not to tease him. Make sure to build success into the activity. If you see him getting frustrated, move it a little closer or give him a break, sing a song or two then try again. These were taken when he was about 2.5 months. These were taken when he was about 4.5 months. He got the concept pretty quick! He even pulls on the blanket so Sophie gets closer. Good problem solving skills there bud! 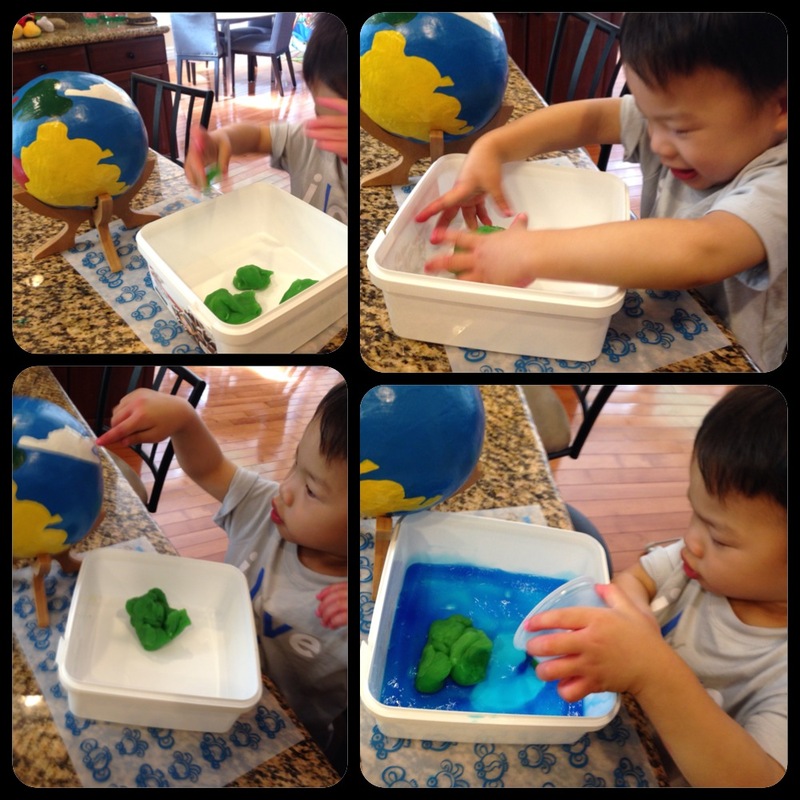 Make bath time fun and exciting is a great way to encourage motor skills. Sitting and splashing in the bathtub is a thrill for both my boys. With the tub filled with lukewarm water and your baby seated on a non-slip mat, encourage your little one to kick and splash and play! When he starts kicking, you can start chanting, “Kick, kick, kick!” This will encourage him to continue kicking. 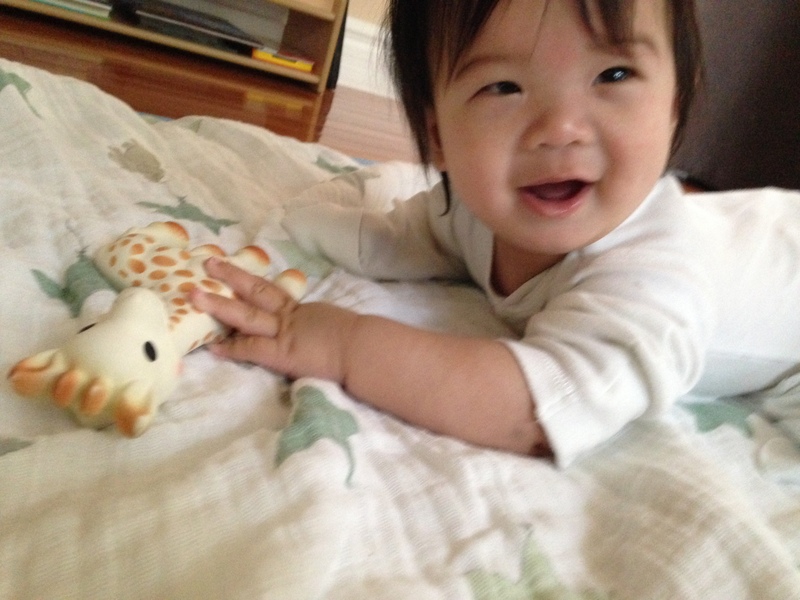 Kicking helps strengthen his leg and abdominal muscles which is important for crawling and then eventually walking. This activity also helps develop his confidence in water which helps when he starts swim lessons. Titus absolutely loves this! He can stay and kick in the tub for a really long time. Kicking feet and waving hands are generally the signs that your baby is beginning to understand that he can somewhat control the movements in his body. Reinforce this by drawing attention to the major body parts for him. Place him on a bed or changing table or the floor then touch his face and say “face.” Hold his hands and make him feel your face, too. Repeat with each body part and make him feel both his own and yours. This provides tactile stimulation and helps him become aware of his body parameters. The song Tony Chestnut is a fun one to sing while pointing to each body part. Tony Chestnut knows I love you. (Toe-Knee-Chest-Nut, Nose, eye love you!) I didn’t get it the first time but now I’ve discovered what a fun song it is! Accompanying these exercises with playful interactions help build a close relationship between you and your child and sows the seeds for a healthy self-esteem, too. Micah loves doing this with Titus. Micah likes blowing on his tummy while singing songs with him. Almost every parent feels the pressure to make their children write right now. But teaching your child how to write isn’t as easy as putting a pencil in his hand and showing him the alphabet. Children greatly benefit from experiences that support the development of fine motor skills in their hands and fingers. They should have strength and dexterity before being asked to manipulate a pencil on paper. Working on this first can eliminate the development of an inappropriate pencil grasp. This happens when children get engaged in writing experiences before their hands are really ready. The following activities involve the use of practical life materials that will support your child’s fine motor development and help build the strength and dexterity necessary to hold a pencil appropriately in the future. All these items can be found either at home or purchase from the dollar store or at Ikea. They have child-size items that will make it easier for the child to handle. These simple practical life activities may seem “easy” for us but it goes a long way with your child. These are indirect preparations that help in the coordination of your child’s movements and development of concentration. 1. Demonstrate how to do these activities next to your child so they can see what you are doing. Usually, you have your child sit first and you sit to the child’s right. 2. Name the objects you will use before you start. 3. Try to use as minimal words as you can and let your movements do the talking. 4. Make sure he/she is watching how you manipulate the items you are using. 5. Your goal is to demonstrate these actions clearly so the child can repeat the activity successfully and independently. 6. 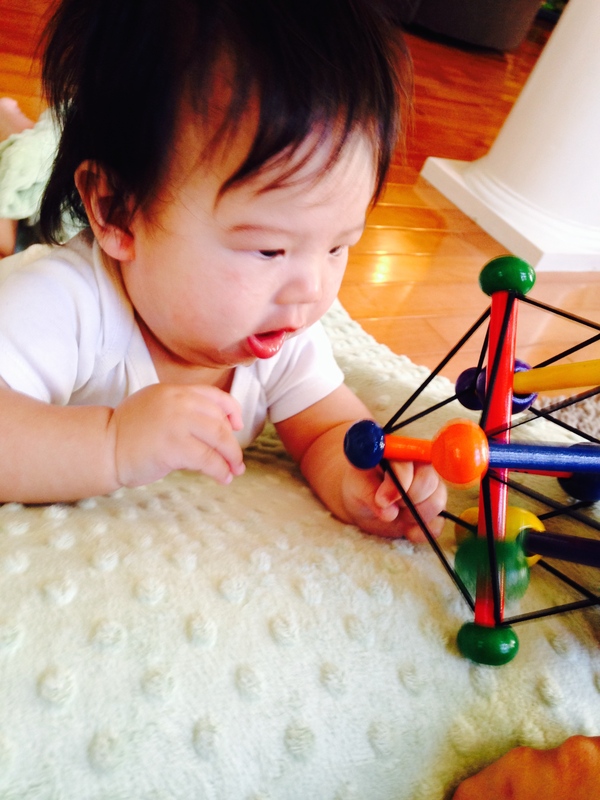 These activities aim to develop his/her coordination, concentration, gracefulness, and independence. 7. Repetition is important. If your child wants to do it over and over, encourage him/her to do so. It helps your child master the skill involved and allows your little one to gain more confidence in himself/herself as well. 8. Make sure to watch out for these important skills: concentration, hand-eye coordination, patience, and hand control. 9. Don’t forget to have your child clean up! a. Wrap your three right fingers around the handle and firmly grip the handle. b. Make sure the child sees you positioning the oval mouth of the spoon in the center of the bowl, so the grains fall into the bowl and not onto the tray. 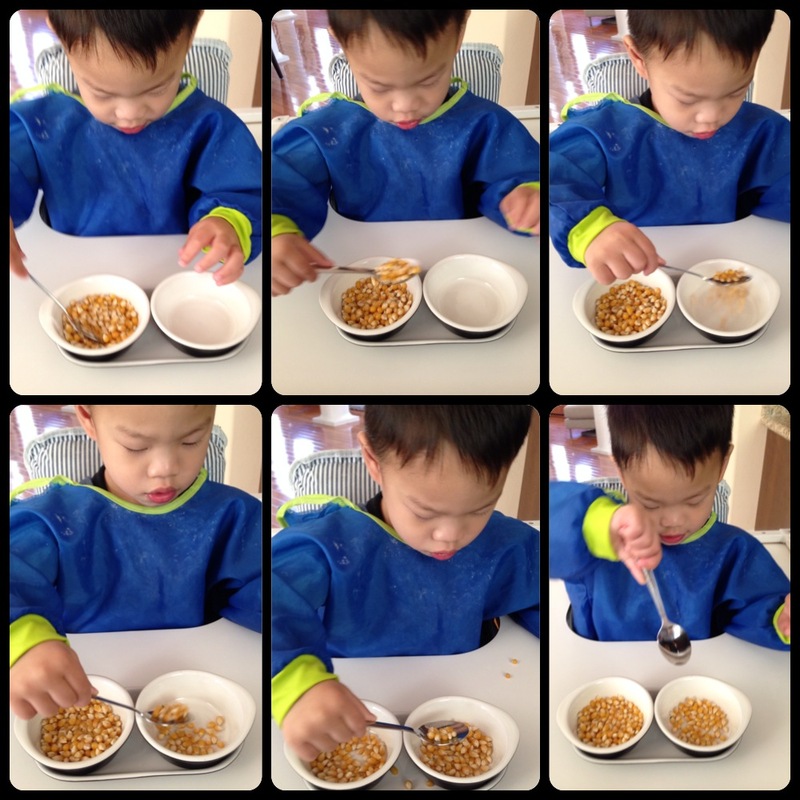 c. If the grain falls, show the child how to remove the bowls and pinch the grains one at a time and replace into the bowl. Variation: You can use jars to practice pouring grains, too. 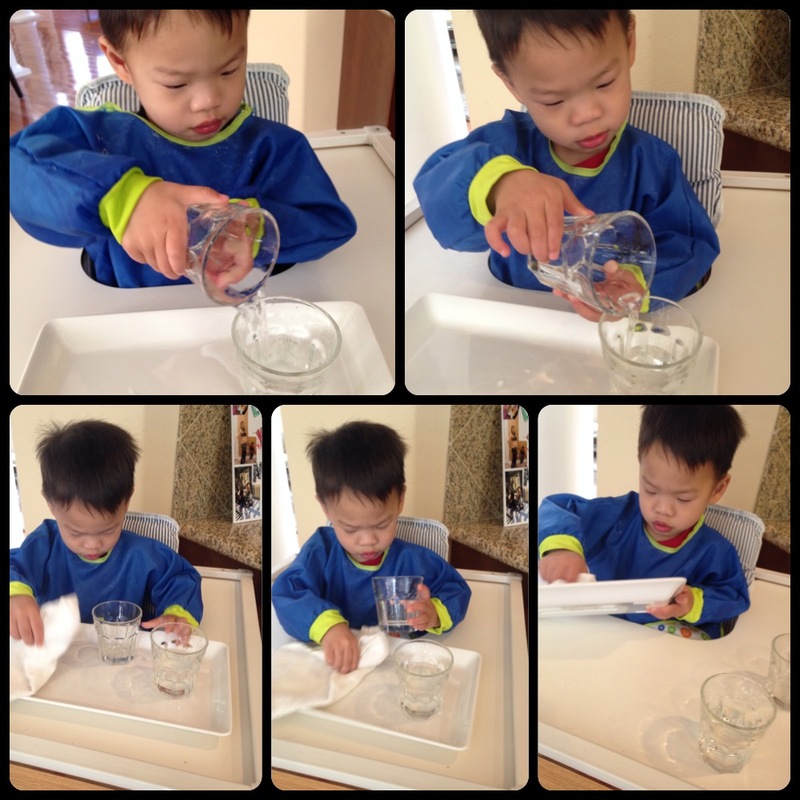 a. Pouring water from the right hand jug into the left-hand jug then from left jug into right jug. b. A cloth is to be used to wipe the spills. 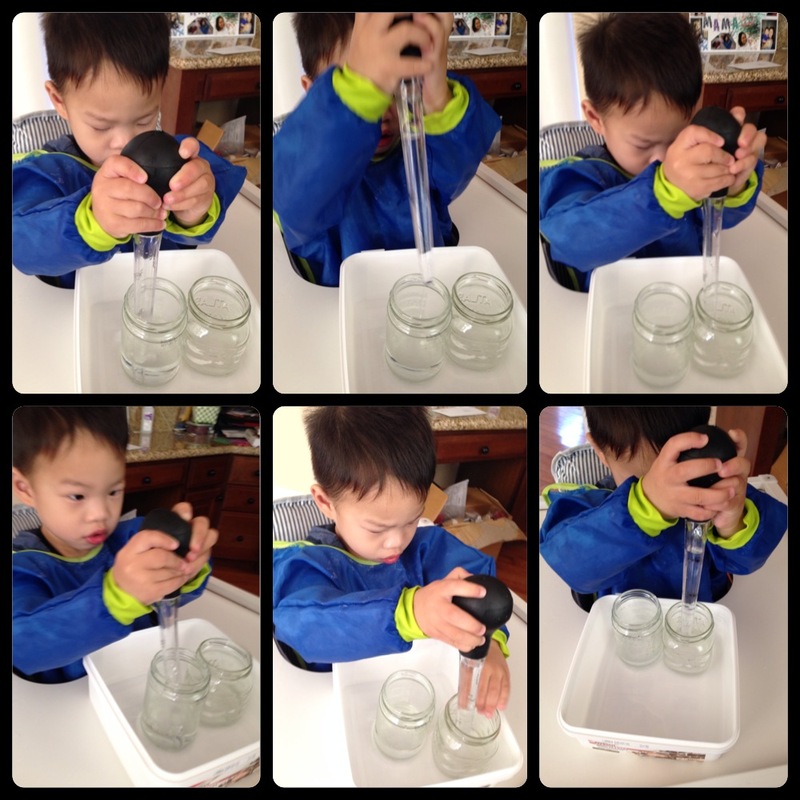 Pouring Water Variation: You can have different size jars, some may even need a funnel. a. Show your child how to hold the baster by the bulb to draw up the water by squeezing it and releasing the pressure on the bulb. b. Move the full baster over to the second container and squeeze the water out. This was a little tricky especially with learning how to manipulate the baster so it took him a few rounds of spills and practice before getting the concept of releasing it after he puts it over the other jar. Micah also realized that it was easier for him after he held the bottle in place by moving it to edge so it wouldn’t move while he squeezed the water out. A towel close by is very handy because this takes a while to get used to. You can use a medicine dropper too. But because of the size of the baster, it makes it easier for their little hands to start with. a. Take the sponge and dip it in the water. b. WAIT a few seconds for the sponge to absorb the water. c. Pick it up and move your hands with the sponge over the other container. d. Squeeze the sponge with both hands over the other container. 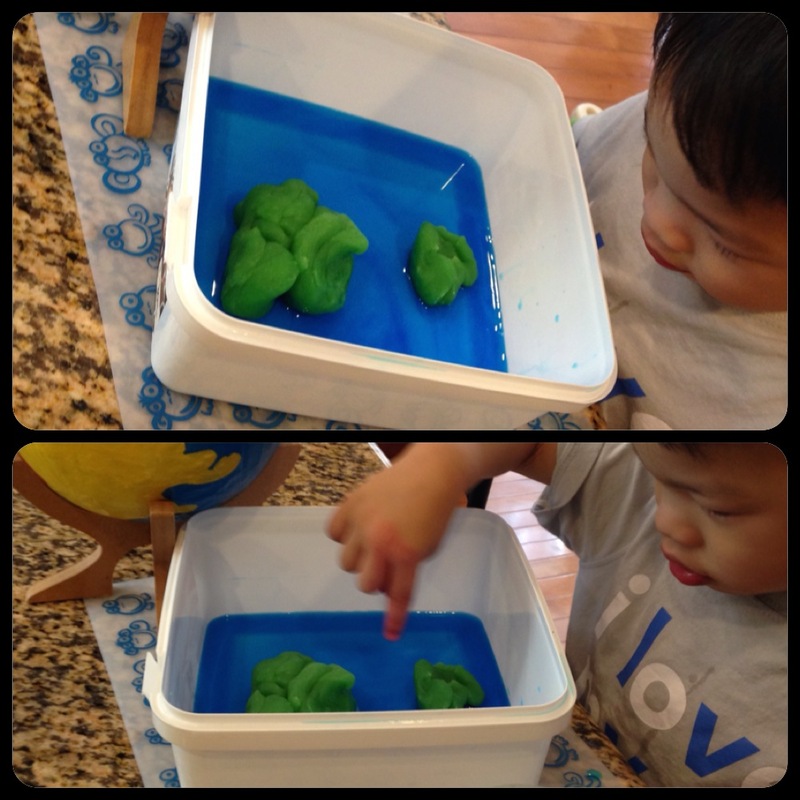 We made homemade Jello Play Dough! They smelled so good and I wasn’t too worried if he tried to eat it. (Thank God he didn’t! 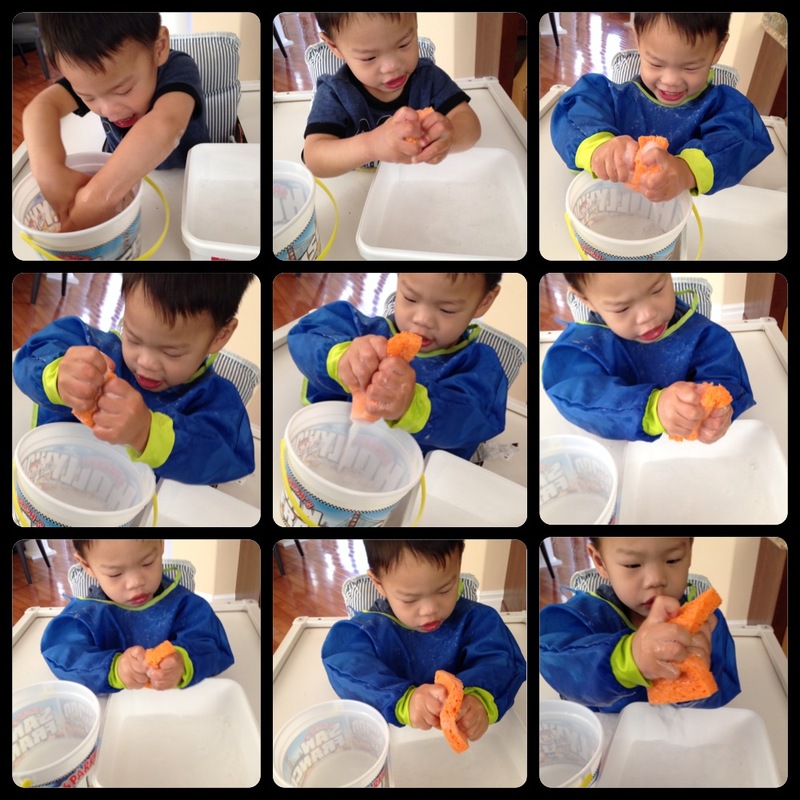 haha) Squishing, squeezing, stretching and moulding play dough helps to build muscle strength in the fingers and hands. Providing small items like buttons, sequins, pasta, pebbles and shells with the play dough will also encourage the child to use his/her hands when picking up and placing these objects in the dough. Put out some shape cutters, a grater, blunt plastic knives and tweezers which can all be used to mould and transform the play dough. In our picture, we used the Melissa and Doug set I found at Ross for $5. Rolling pins foster the development of the precision muscles of the hands. The precision muscles of the hands are the muscles that support the pencil grasp and teaches the child how to adjust the amount of pressure when holding a pencil. Mold & Make Me Something! These are just some of the many things that your toddler can do to exercise his/her fine motor skills. 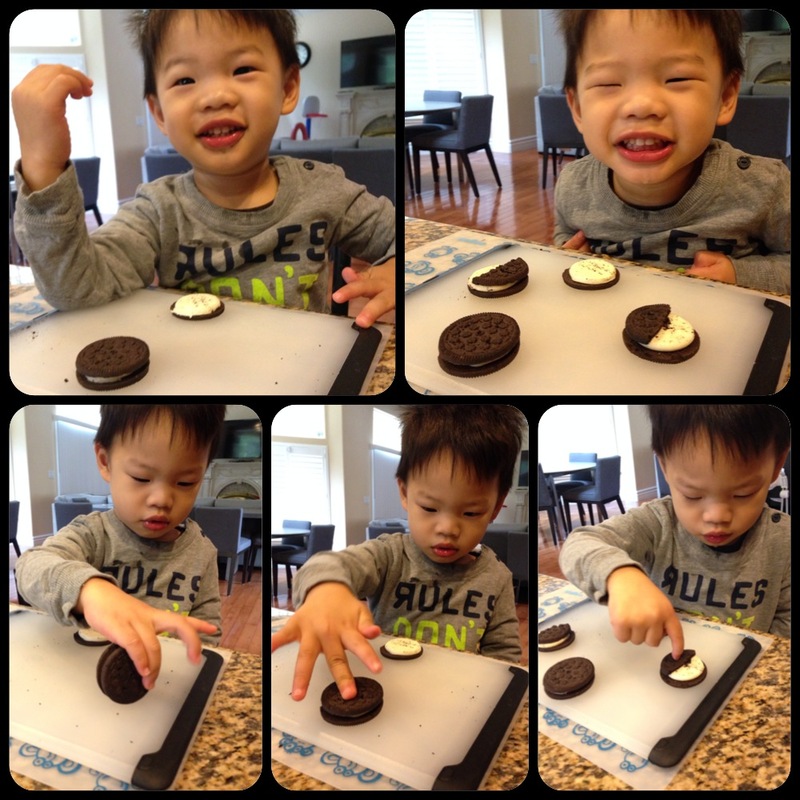 Show excitement and delight when your child accomplishes these tasks! Encourage them to continue doing it. As parents, be in the moment and pay full attention to your child. Developing motor skills is the first step to writing without stressing your child and yourself, too!